Here at Resmar we are proud to be able to offer our customers the Scott range of self-contained breathing apparatus. 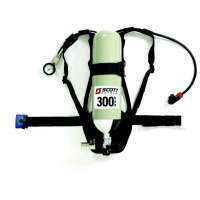 The Scott Sigma 2 type 2 is an open circuit SCBA which can be configured in a number of different ways with different cylinders and masks. The system consists of a carrying harness, backplate and the pneumatic system contains a reducer with integrated cylinder connector, demand valve, pressure gauge and whistle. This unit can be used with the following facemasks; Panaseal, Vision 3, Panavisor and Promask PP. The Sigma 2 type 2 has been designed for use in marine industrial firefighting environments but is also suitable for providing protection in any IDLH-type environment. It is CE marked in compliance with EN 137:2006 type 2. This unit is equipped with a Tempest demand valve, which is a compact, positive pressure demand valve, which features a servo-assisted tilting diaphragm mechanism and low inspiratory resistance and responsive dynamic performance. It also features automatic first- breath actuation and hands-free bypass facility. The demand valve is manufactured from injection moulded polyamide with rubber seals and diagrams. The pressure indicator is a Bourdon tube type dial indicator, which includes a heat and impact resistant polycarbonate lens, safety blowout vent in the rear of the gauge. The dimensions are 600 mm x 278 mm x 200 mm and the unit weighs 2.3 kg without the cylinder.